It doesn’t take much looking around today to know that being a Christian is often frowned upon, no matter where you are in the world. In the United States, we are considered politically incorrect. In other countries, we are treated as criminals. The temptation to be silent and hide is strong. I know, because that is what I did for years until I became fed up. The fear of being looked down on and losing friends was a heavy burden to carry. Heavy, until I realized what was happening to others on the other side of the world. In fact, long story short, it was hearing a sermon on something along these lines that brought me to beginning this blog and “coming out of the closet as a Christian”. Paul faced a ton of adversity when he made the decision to follow Christ. Yet he never let that stop him. He shared Christ with every person he came in contact with. 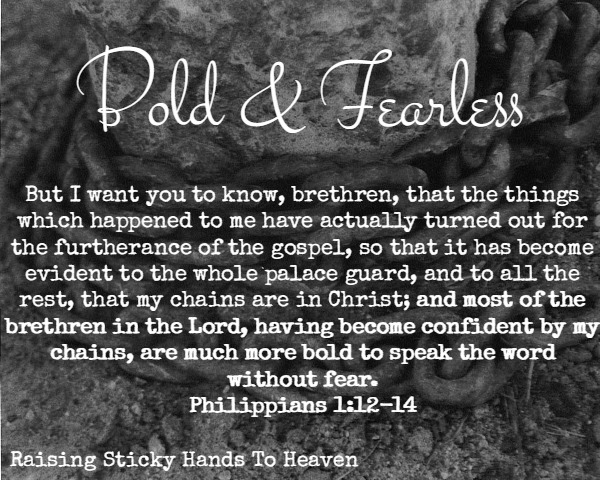 Confidence in the Lord wiped out all fear and gave him boldness. This is not an easy place in time to live in. We fear the loss of jobs, friends, family, and freedom for following Christ. Sadly, many have had to give all of that and more up already. Terrorists and anti-Christian regimes strip our brothers and sisters of their rights, possessions, and loved ones daily in other parts of the world. Yet, they stand firm. They are BOLD and FEARLESS in their proclamation of following Christ. I want to challenge you. Be bold and fearless. Become confident in God, that no matter what happens, He is in control. Stand firm in your faith and never waver because you are afraid. No matter if the fear is of something small or large. Because in the end, God wins, evil loses, and our reward in Heaven will be worth every bit of grief we face on earth. If Jesus, Paul, victims of ISIS, and countless others can do it, we can too.